Brennan Harkema, 11, of Cedar Springs took his first deer—a four-point buck—on Sunday, Dec. 18, on an evening hunt with his dad. Brennan was on the ground, set up behind a downed tree, while his dad was in a tree stand watching over a swamp. Brennan’s buck stood up about 250 yards out and came straight to him. 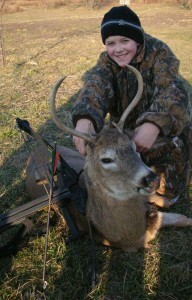 Brennan got a shot at about 20 yards with his crossbow. It was a great night for both Brennan and his dad.